Hanoi (VNA) – A ceremony was held in Hanoi on March 22 to mark the World Water Day and start the Vietnam International Water Week, aiming to raise the public’s sense of responsibility towards the protection, sustainable exploitation and development of water resources. Minister of Natural Resources and Environment Tran Hong Ha said Vietnam has the 15th biggest population in the world, and two-thirds of them reside in the basins of the Red, Mekong and Dong Nai rivers. In recent decades, Vietnam has worked hard to improve water supply for residents in both urban and rural areas and promote people’s participation in river basin management. He added the country has stepped up surveying surface and underground water resources, exploring water sources for mountainous areas or regions with water scarcity, and seeking smart solutions for water governance and protection. 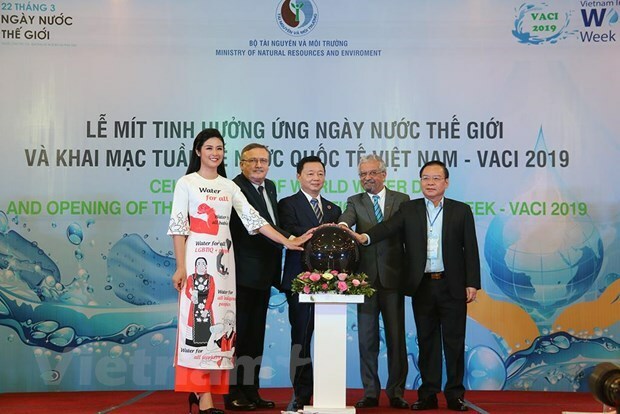 In response to the World Water Day (March 22), the Vietnam International Water Week 2019 was opened with the aim of learning from other countries’ experience in smart water governance and improving public awareness of efficient water use.